Is beer not good enough? Has no one made pitch-perfect hoppy ale? I mean, what if in the evolution of brewing, we’re still at that part of the chart where we’re all just hunched over, early hominids—perhaps Austr-ale-opithecus—which is why we tend to have poor posture while perched1 on bar stools? The fact is, we’re in the relatively early stages of Humulus lupulus and there are botanical geneticists who are cultivating more perfect hops as we speak, and sip. In Washington’s Yakima Valley, Jason Perrault developed the new rock star, IPA-worthy hop that is Citra—high in all-important alpha acids and yields notes of pineapple and mango—at Yakima Chief Ranch, now part of the joint venture with John I. Haas, Inc. called the Hop Breeding Co. Dr. John Henning hopes his new Mt. 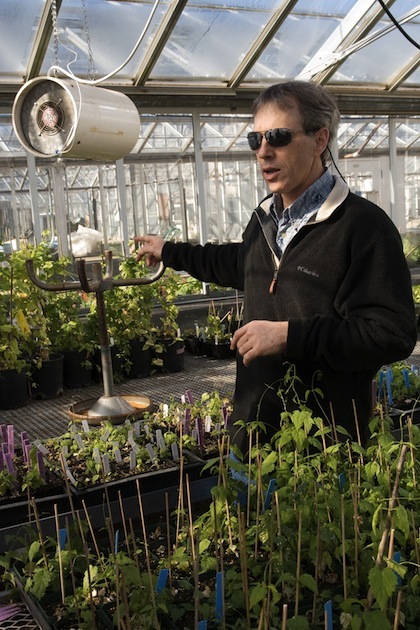 Rainier hop—spicy with a hint of licorice—catches on; he created it at the U.S. Department of Agriculture’s Agriculture Research Service (USDA-ARS) on the Oregon State University campus in Corvallis, OR. It’s a workhorse Noble variety hop akin to grassy Hallertauer that is fairly disease resistant, tolerant to downy mildew and high-yielding with the added benefit of a desirable aroma—if you like a little licorice notes mixed with your citrus. And across the Atlantic, Dr. Peter Darby finally gained the EU Plant Variety Rights for his Sovereign hop, which exhibits classic English hop aroma like that of Fuggles—earthy with a kiss of tropical fruit—but as a dwarf variety so attractive to British hop growers. After years of breeding research and evaluation dating back to the 20th century, their efforts are just now blossoming in new beers. So imagine what you’ll be drinking starting in 2020 based on what they’re doing in their respective offices today. Is it rocket science? Not exactly. NASA recently retired the space shuttle Discovery after 30 years of exploring Earth’s low orbit so as to focus on exploring deep space, beginning with the Mars Science Laboratory and plans for the Juno spacecraft already in the works. While hop-breeding programs are, by nature, futuristic, there is way less computer hardware involved and way more dirt. Sure, there’s some software involved, but hop crosses yield seedlings that are planted in test farms and evaluated based on agronomics and aromatics. There’s no HAL 9000 in this Beer Odyssey capable of olfaction. Instead, someone like Perrault, for example, simply stands in the field, grinds some leaves between his fingers, brings them to his nose and has no clue if he’s getting a whiff of the next Simcoe (the pine-and-grapefruit scented megastar for which he holds the patent). But there’s roughly one-hundredth of a percent chance that he smells the future. And it kinda smells like citrus, or tomatoes, or possibly cheesecake. Whether you believe that Pliny the Elder, a Roman botanist, was the first to identify hops shortly after the beginning of the common era, or the honor belongs to Leonhart Fuchs, a 16th century Bavarian botanist (as recounted by Martyn Cornells on his Zythophile blog), either way this pungent flower is a relative newcomer to the millennia-old world of beer and as divine as it is, it’s being perfected all around the world. Stan Hieronymus is presently writing For the Love of Hops (Brewers Publications), which will fully explore the past, present and future fascination with, and application of these consecrated cones. There’s only one species of hop but there are scores—hundreds even—of varieties grown on every continent (need we say, save Antarctica). There are serious hop breeding programs around the globe selecting new varieties to cultivate or, more commonly, “cultivars,” contracted from “cultivated varieties.” We won’t dwell on the Czech Republic where they grow almost nothing but herbal Saaz hops; their pilsners are amazing, but what have you done for us lately, Bohemia? There’s the Hop Research Center in Hüll, Germany; Wye Hops Ltd in Kent, UK; Hops Product Australia down in Tasmania; and, here in the U.S., there are breeding programs in the public and private sector. That’s where Dr. Henning and Perrault come in, respectively, as there are half a dozen serious breeding programs in the U.S. alone. Incidentally, not all hop research conducted on the OSU campus falls under the USDA’s umbrella. A new craft-centric hops supplier called Indie Hops bankrolls OSU’s breeding program, making the hop breeders and chemists who work down the hall from Dr. Henning his colleagues but not his coworkers. There are 50, maybe 70 hop farms, by Perrault’s estimate, left in America, with a few new ones boasting small acreages in less obvious places like New York and New Mexico, and even the White House garden. That number is down from around 200 back in the 1970s, but the acreage each farm accounts for, logically, has increased. 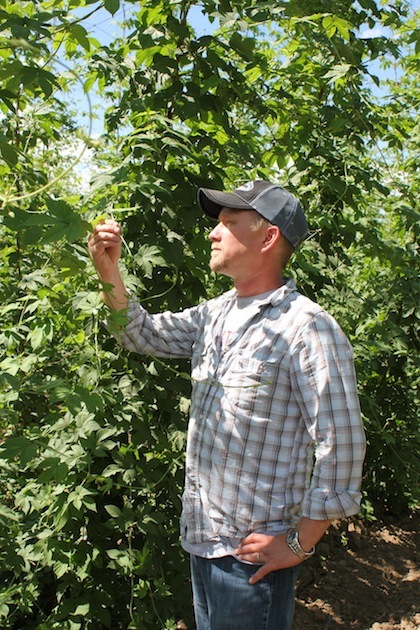 According to the Hop Growers of America, U.S. farmers grew over 65 million pounds of hops last year (only Germany grows more), just under 80 percent of which was grown in Yakima where Perrault himself is a fourth generation hop farmer. Perrault Farms is one of the Hop Breeding Co.’s licensed growers. Oregon’s Willamette Valley produced roughly 16 percent of total U.S. volume thanks to growers like Blake Crosby, a fifth generation hop farmer, who plants exclusively USDA hop varieties. One solitary acre of his B. Crosby Hop Farm is set aside for experimental rather than commercial hops, specifically because he aims to be a resource for craft brewers whose hop utilization rely 80 percent on domestic hops. It’s American craft brewers who are clamoring for new cultivars and with the growth in the craft segment compared to the industrial brewing companies, breeders are finally starting to work closer with them. How exactly does a new cultivar go from germplasm to a brewkettle? Slowly, carefully, deliberately and luckily. The process begins with making a cross, which is to say selecting which female and male plants might create the perfect progeny, then in a year it’s ready to plant in a greenhouse. A selected seedling is then tested in a field to see if it’s strong and immune enough to survive while being hearty enough to be easily picked and stored for the sake of hop growers. Three or four years’ worth of evaluating its benefits may see fit to include the hop in a select panel for cloning and expanded trial farming before it makes its way to a brewery to evaluate its utility and desirability. More on how a brewer is given the opportunity to evaluate new cultivars in a minute. As an overview, Henning says if he comes up with 15,000 seeds today, perhaps 1,500 will make their way to a field and of those, only five to 10 will become available to the commercial brewing industry by the year 2020 at the earliest. Engineering new hops, like designing new beers, is part science and part art. And just because something smells amazing right now, there’s no way of knowing how it would translate in an actual beer a decade down the road. During the trial years, all the factors that determine if a new hop is a goody or not, are scrutinized with both the farmers and then the brewers in mind. Now that all new varieties of hops are patented, breeders in the private sector stand to make some good money if they strike oil—essential hop oil that is. Evaluating hops entails doing chemical analysis of its alpha and beta acids to determine its application and efficiency in bittering and imparting aroma. It is then selected based on agronomic factors such as resistance to diseases and pests, how well and big (or small) it grows, which influences the amount of yield (measured in terms of acres) and what is called pickability. Furthermore, storageability is an important aspect since who wants hop cones that will go bad right away? Agronomics are vital to the brewers in that they determine a hop’s price because if it is difficult to grow, produce good yield, pick or store, it’s not economically viable to the grower. Try convincing a family-owned farm to harvest an unprofitable crop. On the flipside, hops bred in our public sector give botanists like Dr. Henning benefits by having “a mandate from Congress to do research in genetics for the benefit of the American industry.” One key element among global breeding programs is how varieties fare in their respective climates. Dr. Darby said that selecting for disease resistance not to mention funding sources drives the U.K. program. Developing a resistance to wilt “has been a feature of the breeding here since the early part of the 20th century.” He adds “the U.K. is looking at a small industry with a very defined customer base for a premium market. The U.S. hop breeding [programs] serve almost the exact opposite.” Zing! What he meant, diplomatically, is that the domestic industrial brewers, by virtue of accounting for some 80 percent of the industry, growers still rely on those contracts to keep their farms from being repossessed. American hops are “a commodity market,” as Dr. Darby called them, requiring “rapid production of a bulk product,” but as the craft segment grows and aromatics vie for alphas, the dual targets are approaching equilibrium. Even in England growers are “trending toward American-style hops” as brewers seek a change in the objectives toward stronger, unusual hop aromas. Switching from aromatics to agronomics, those lucky Kiwis don’t have powdery mildew or aphids down there, so those are non-issues in their burgeoning Nelson region. But in Japan, back in the 1930s, they discovered the presence of Hop Stunt Viroid (HSV) and rebuilt their hop programs afresh, which solved the problem. This virus-like particle doesn’t have a protein code around it, just the RNA. Henning noted that it’s a pathogen that can severely limit hop growth and production and varies dramatically from variety to variety. Great efforts eradicated HSV in Japan, but it seems to have arrived in the U.S. possibly some five years ago. Fear not, it is not exactly the mad cow disease of hops that, if it makes its way into your beer, would turn you into a babbling idiot (unless, you know, that’s already the case), but it concerns Henning nonetheless. USDA-ARS geneticist Dr. John Henning (left) and Annheuser Busch agronomist Scott Dorsch examine and smell hop cones for quality and aroma characteristics. The real test, the real magic, in what breeders do, lies in what happens between the greenhouse and the growler. They’ve designed a new hop. Sure enough it survived in the field, no matter how small. But will it be any good? If no one wants to brew with it, or, more to the point, drink that brew, what good is said hop even if it is, say, tolerant to Prunus necrotic ring-spot virus or boasts beneficially low cohumulone? In working with commercial brewers, breeders obtain feedback on whether they’re building the next Rolling Stones or the next Milli Vanilli. And just like it takes a major record label to really support a band and turn them into rock stars, typically only larger regional breweries pony up to support growing experimental hops and see if they have something worthy of the top of the charts, or trellis as the case may be. Widmer Bros. Brewing brewmaster Joe Casey said John I. Haas, Inc, now part of the Hop Breeding Co., approached him in late 2007 with an experimental strain created by their breeder, Gene Probasco, back in 1990, simply numbered 114. “We subsequently dubbed it ‘X-114’ inside the walls of Widmer.” Its mother was a comely Hallertauer mittelfrueh and its father was a U.S. Tettnanger on the prowl. The bouncing offspring displayed notes of citrus as well as tropical fruits like lychee and papaya. Widmer didn’t get to play with it exclusively, since it was co-funded by Sierra Nevada and Deschutes as well. But Casey did brew with it and entered that beer into the 2008 World Beer Cup, where it promptly earned a gold medal. Convinced he had a winner on his hands, the brewery signed a five-year contract to keep them in steady supply. Having said that, contracts are generally tied to a varietal, but given a year or two’s notice, that can be swapped for a new one in case something sexier comes along. Because of the abundant amount of experimental hops breeders work with, they are simply numbered. Naming each of the 10 or 15,000 new hops would be like naming each and every “swimmer”—there’s a reason you only name the baby. Later that year, Perrault patented and trademarked the numbered strain under its new name, Citra. Of course, it’s wildly popular among American craft brewers and Widmer just released this gold-medal-winning beer as part of their new Rotator IPA series, sticking with the name X-114 IPA. Famously, the first bottled beer that Citra showed up in—a canvas for this high-alpha hop that Sierra Nevada’s Bill Manley described as “Simcoe on steroids”—was Sierra Nevada Torpedo Extra IPA. Of course, their usage didn’t stop there. Citra is also featured in Sierra Nevada’s new imperial IPA, Hoptimum, along with a proprietary variety Grossman said goes by “363,” and added it will “definitely” become a named hop. With names that often sound like Zoolander “looks”—Magnum, Hercules, Taurus—the botanist behind them can cull from inspiration wherever it washes over them. Dr. Henning would like to see Newport be his legacy. Bred as a replacement for Galena, it boasts higher alphas and betas, higher yields and is resistant to downy and powdery mildew, which means less spraying. He named Newport after the coastal Oregon town where he loves to surf. Serendipitously, that’s where Rogue Brewing is located so he approached brewmaster John Maier about hopping with Newport. Maier called it “one of the most beautiful hops on the vine, but it doesn’t have much aromatic quality.” Rogue planted it in their own 40-acre farm and it shows up in a few beers including a wet hop ale, but otherwise it trudges along as a tool to reach desired International Bitterness Units, since it’s all about the IBUs. “Unfortunately,” lamented Henning of his would-be legacy, “it hasn’t taken off.” Once a hop debuts, name and all, that’s no guarantee it will become highly coveted, or that it will even survive. The varieties used, and manner in which brewers hop their beers is ever changing. Pelletized hops are already more abundant than whole cone hops. Increasingly, hop dealers are popularizing “downstream products” such as hop oils, CO2 extracts and isomerized extracts—refined products derived the flowers much the same way crude oil can become petrol, plastics and pesticides. In the brewhouse, will whirlpools and hopbacks themselves become obsolete? Rather than marching in some scary direction the way the processed food industry has already done, progress in hop breeding doesn’t mean Monsanto-esque genetically modified hops. Instead of GMOs, the trend is toward organic hops since ultimately the votes that count the most are the paying consumers. As craft beer drinkers learn about the appellation of their hops—Willamette, Kent Goldings, Nelson Sauvin—the way wine drinkers know their grapes, there’s been a growing demand for local and organic hops. Dr. Henning confirmed that the USDA-ARS has a strong component in trying to address those needs, especially because the USDA’s National Organic Program (NOP) mandated that by 2013 organic beers could only be made with organic hops. As such, there’s always a new direction for new hops. Varieties are ephemeral. “You’d have to assume that these varieties will evolve into something else,” said Crosby, whose personal farm abounds with Willamette hops as well as Nugget, still popular among the large breweries. He grows Cascade, too, the hop regarded as the quintessential, iconic American hop ever since Grossman popularized it with Sierra Nevada Pale Ale. Crosby says is hard to imagine it will ever go away, “but if you look at the past maybe it’s inevitable.” After all, his father and both grandfathers grew Brewers Gold and Bullion on acres aplenty. Where are those today? 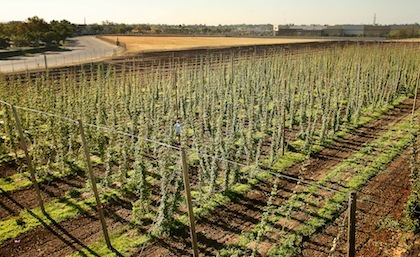 The hops fields surrounding the Sierra Nevada Brewing Co. in Chico, CA, were first planted experimentally in 2003. 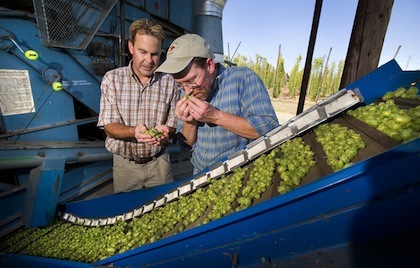 In 2008, the hops were used exclusively to brew Chico Estate Harvest Ale. Industry-wide and industry-wise, there’s little to no interest in heirloom hops. Dr. Henning is merely interested in them for cataloging purposes. Growers don’t find them practical and breeders don’t find them profitable. Everyone wants new world hops. And the new flavors they introduce. Another new hop that Widmer brewer Casey experimented with is called Galaxy and, while nominally in use in its native Australia, Widmer Bros. Galaxy-Hopped Barleywine Ale may be the first beer it showed up in domestically. The name is part of a trend to give such new world hops a high-profile platform. Galaxy is described as imparting passion fruit. El Dorado’s descriptors include watermelon and “cherry Life Savers.” What people smell while conducting rub and sniff tests don’t always translate to the finished beer, but the industry is hell-bent on discovering wild aromatics. Unlike the shuttle Discovery that is heading for the Smithsonian, breeders and brewers don’t put hops in a museum. Nostalgia doesn’t push the envelope for new beers. The HBC almost got lucky with the timing of their release of Citra during The Great Hop Shortage, which wasn’t relegated to Yakima but occurred worldwide. The fact that hops are now being bred and grown from New Mexico to Alabama, and from Tasmania to Xinjiang (China) means that the opportunity for interesting new varietals springs eternal. Don’t be surprised if Perrault releases the one he said really picks up a cheesecake aroma. If he does, that experimental, numbered hop may become an A-lister or never even land a walk-on role. Next, his own two kids may breed hops in the future (they potentially represent his family farm’s fifth generation) with the mission to boldly spice where no beer has gone before. Brian Yaeger is the author of Red, White, and Brew: An American Beer Odyssey. He lives in Portland, OR, with his wife (and first baby on the way) and treats beercationers at their bed-and-beer, Inn Beervana, to his homebrew.